Lastly, the winners of the Grad Slam Performing and Creative Arts Competition had the opportunity to perform during the Final Round. The performers and the title of their pieces are listed below. Use the links below to learn more about the competition. 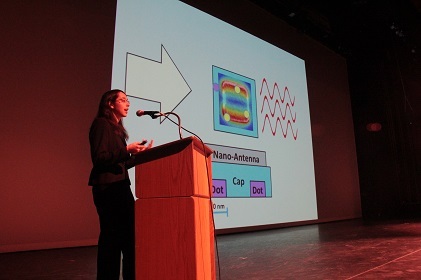 Grad Slam is hosted by the Graduate College's Graduate Center, and the Graduate and Professional Student Council. Grad Slam 2019 Sponsors: UA Office of Research, Discovery, and Innovation (RDI), University of Arizona Libraries, UA College of Science, UA Institute of the Environment, and the Agnese Nelms Haury Program in Environment and Social Justice. Want to sponsor Grad Slam (an award area or the event itself) or have additional questions? Contact David Bradshaw at bradshad@email.arizona.edu for more information. Themed Awards are offered in addition to the grand prizes. Competitors can win a themed award along with a grand prize. Please read on for more information about eligibility for each award. To be considered for this award, you need to have a primary affiliation with a College of Science graduate program, and be presenting a project on any topic in science. Students pursuing dual-degrees in graduate programs in the College of Science are also eligible for this award. To be considered for this award, your presentation should address environmental challenges in Arizona and around the planet as it relates to your project. Examples include, but are not limited to, climate science, artistic dissemination of environmental knowledge, and environmental stewardship. To be considered for this award, your presentation should address social justice concerns as related to your project. Social justice components in a project include active community voice and engagement, with project direction informed by the community, and the community engaged as an equal partner (i.e. research with the community, not on the community.) Social Justice often refers to ways of addressing challenges that individuals or groups face concerning inequality created through the distribution of resources, whether physical or cultural. Examples include, but are not limited to, developing of best practices for community engagement, addressing questions of equity for underrepresented groups in society, exploring the role of demographic markers in the provision of goods and services, and the confluence of economic and environmental factors on social issues. The Haury Program often uses the Southwest Sustainability Doughnut (southwest_sustainability_doughnut.pdf) as a visual representation of their areas of interest. It can be used to help determine if your project is suitable for their themed award. PLEASE NOTE: All Grad Slam awards are in compliance with Affordable Care Act rules. The awards are not counted toward work hours, and will be given to the winners either by check or disbursed through the winners' bursar accounts. Grad Slam is a tournament style competition. Students initially present in the preliminary rounds. Two students from each of the preliminary rounds will be selected to move to the semi-finals. Then, the top three students from the semi-final rounds are selected to present in the Final Round for the grand prizes. Students may present on original research or creative projects they are conducting for a thesis, dissertation, terminal project, or any other project they are working on. The project can focus on the development of new ideas, methods, or products, or it may focus on the application and revision of current methods or models. Student artists should focus on how their creative work applies to the broader exchange of ideas and the role the creative work plays in providing new perspective or in changing attitudes. Presentations are to be spoken word. Poems, raps, and songs in place of spoken word is not allowed, although an excerpt as part of the presentation is permitted. Presentations may use supporting materials. If using slides, only 6 slides or less may be used, including the title slide. Slides must be in PowerPoint or PDF formats. Audio and video is permissible, but judging emphasis will be on the presentation. Prominent members of the University and Tucson community will serve as judges. Presenters will be evaluated on their ability to convey in a compelling fashion the value of their research or creative work to a non-specialist audience within the 3-minute time limit. 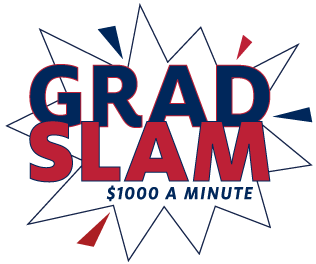 Please download the Grad Slam Scorecard for more details. Workshops and Information Sessions - Click here for a full schedule and listing of topics. 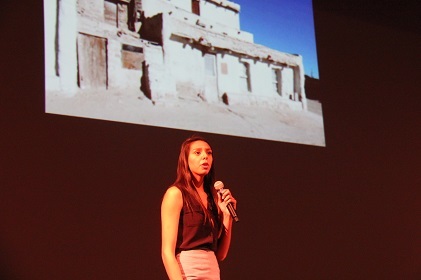 View the presentations of previous Grad Slam Finalists at the Grad Slam Videos Page. Tech Launch Arizona's First Pitch Fridays - Want a practice your presentation? This is one place you can practice and get feedback, especially if your project has potential for commercialization.